You can now optionally group the results of parts and sets listings by a choice of fields, and filter the list with multiple selections at the same time. The available fields will depend on the page you are on. You can still sort the pages, and it will sort by your selected criteria within each group. Change the filters on the left by ticking or unticking what you want and hitting the Apply Filters button (there is one button in each filter box but they all apply every filter). There are also the All or None helper links to tick all or none of the items in a specific filter box. 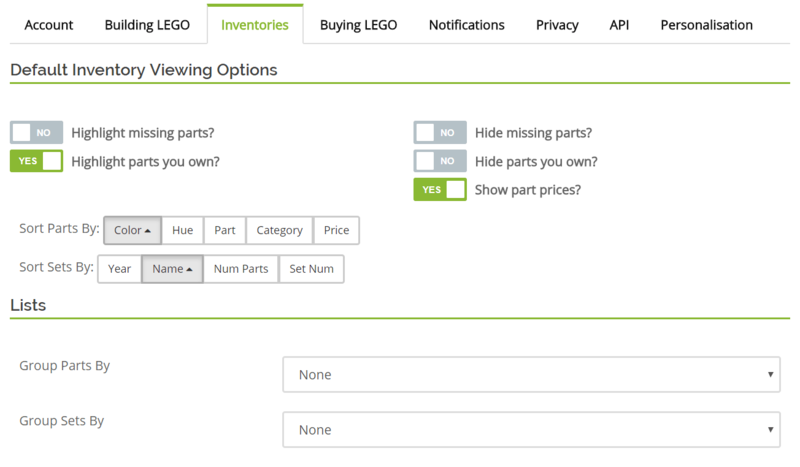 You can now add a single part to your LEGO collection directly from any Part List page. 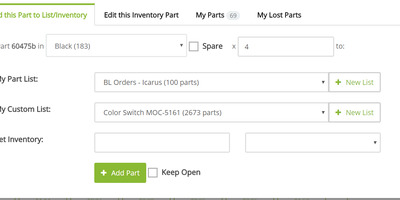 Click the + Add Part button which will popup a panel for you to enter the part number, color and quantity. Like other auto-suggestion fields, you can enter the part number or name to search for the part you want to add. Similarly, you can add a single set from any Set List page (this has been around a month or so but figured I'd mention it anyway). Of course, all the other methods of adding parts/sets are still in place. There are far easier methods if you don't want to add them one at a time. The help pages under Managing your LEGO Collection will be kept up to date with all available methods. On the sidebar for each set, you can now see the details of what Set List(s) contain the set and edit it right there. Changing the quantity will immediately update the quantity for that list. Setting it to zero will remove it. If you see a tick next to the list name, the list is being included in build calculations. Underneath you will see two ranks. This is calculated based on how many users own that set, with the most owned set having rank 1. The Rank (year) entry ranks the set against other sets released in the same year, whereas Rank (all) considers every set ever released. And because someone will probably ask, the 42009 Mobile Crane MK II is the most popular set ever, and the 21309 Saturn V is the most popular set from 2017. 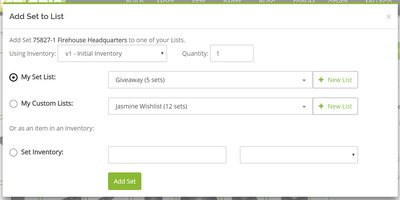 When you add sets or parts to a list, you can now more easily create a new list at the same time. From the Add Set to List and Part Details popups, you will see the + New List buttons. Clicking them will show an extra field where you can enter the name of the new list, then click the Add Set/Add Part button as normal for the list to be created and have the new item added to it. On your LEGO Summary profile page, there is a new chart. 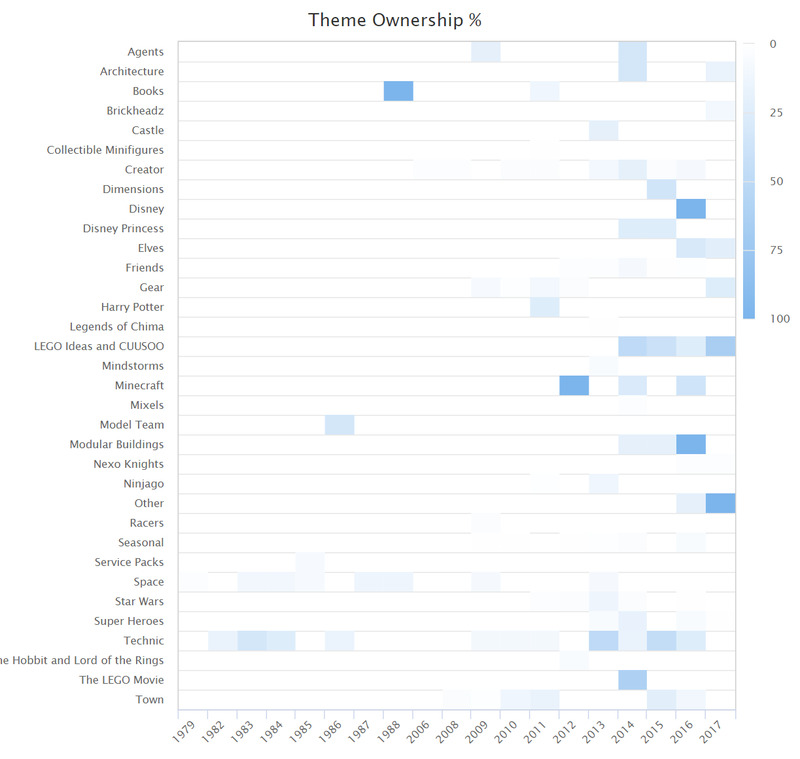 It is a heatmap showing the percentage ownership for each theme per year. 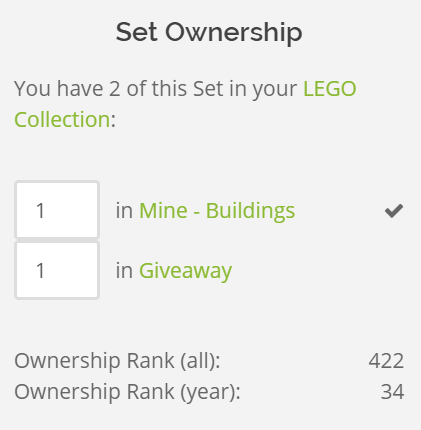 So for example, I own 100% of Minecraft sets released in 2012 (there was only one!) so it shows up darkest blue. Whereas, I only own 4% of Town sets from 2008 so it's very light blue. A new feature only for Pro/Designer Plan users. 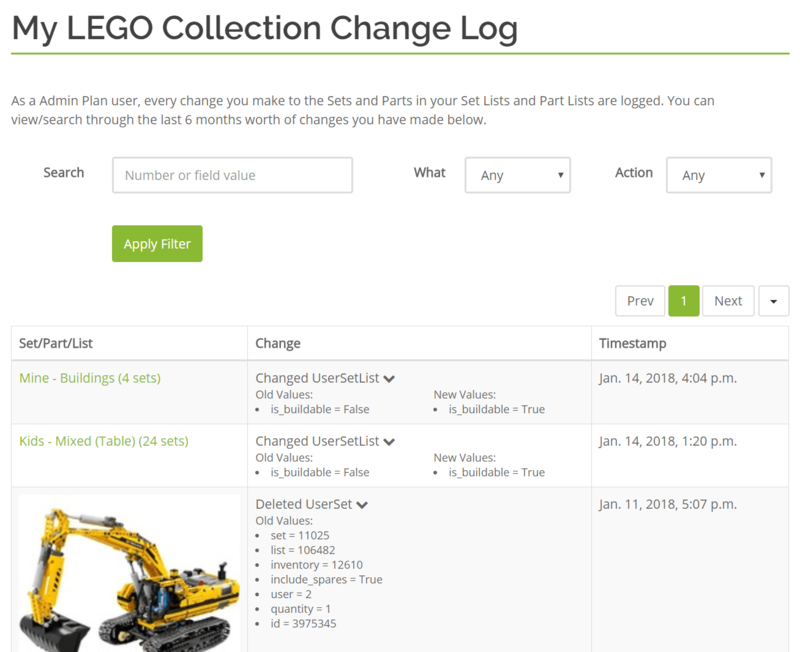 In addition to the current Pro feature of automated daily backups of all your lists, now every change you make to a set or part in your LEGO collection is logged. There is a new menu item under > Change Log which will let you browse/search the log. So you never need fear making an accidental change again. You can always go back and see exactly what you did. The last six months of changes are kept. Not a Pro Plan user? Check out the Upgrade options! I hope everyone finds these new features useful. 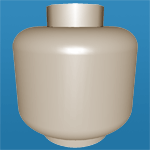 As always, I will continue tweaking and improving Rebrickable. If you have suggestions for a new feature, please use the Suggestions Forum for it to be considered! I'm also curious - what other software do people use to manage their collections? Is there a possibilty to have a “buy parts” for all sets you have shown (even on multiple pages), when having selected the “see what I can build” within a given range? Many thanks by the way for the enormous handy site and features! Thank you very much for the constant progress this site makes! 1) Define/mark a Custom List as "built/assembled"
If some of the above is already possible I'd like to get a short explanation how to do this. Thanks again for your excellent work put in this site! 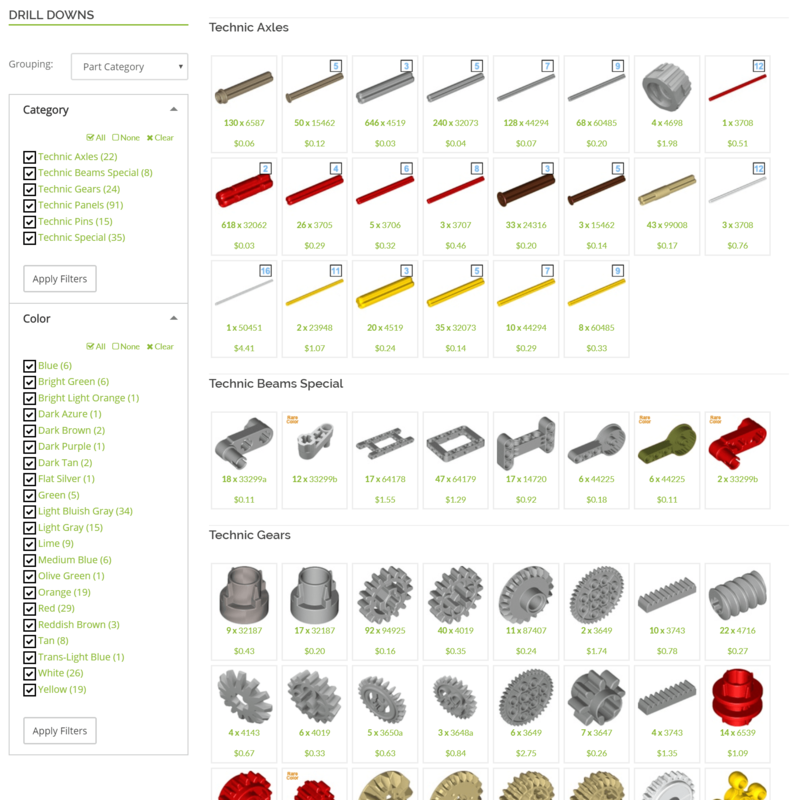 I feel obliged to thank you for your latest upgrade of Rebrickable as now I can view/manage my set/parts list much easier! Thank you for your constant upgrading/love of Rebrickable! I feel obliged to especially thank you for your latest upgrade in which I can find/view/manage my set/part collection much easier than on past versions of Rebrickable! Seriously, these change are ridiculously cool. I had suggested a few variations of these feature hoping you might do one of the sipler things I suggested but you did something with even more features than my most advanced suggestion. I never expected that. This is all gonna bi terribly useful. Thanks a lot! It would be *VERY* useful to have a flag to filter part lists to ignore color differences and thus display only the parts that differ by shape. Often I browse the parts lists by visually searching for a specific part (because I do not know the name, or even the category) and IMHO I've to review and click "next" too many times just because I've the same piece in 10 colors. Sometime I need only to see the shape of the parts, ignoring the color; more or less what the Build! calculator does when it tries to tell you what you can build ignoring color differences. I think this switch could be added everywhere, just to power up the browsing/searching capabilities of the various parts of the site. Wow, the change logs are a great addition. I often find myself wondering if I have added an item to my inventory yet or not but now there's a simple way for me to find out. Very nice! I really appreciate all of the hard work you do on this site! Regarding the change log, does this happen behind the scenes on all accounts, or are changes only logged while a user has a pro account? For example, if I upgrade today, can I see a history of my collection changes? It only logs changes while you are on a pro account. It would use way too much storage otherwise. Hi Nathan, I use both Rebrickable and Brickset to manage my set collection. I have my Lego collection split between two locations: the US and Australia. Having Set Lists on Rebrickable was great as I could have one List for the US and another for Australia, but when I synced the sets from Rebrickable to Brickset (from the Brickset page), it completely messed up my Brickset collection since the Brickset code doesn't understand the concept of the Set Lists and messes up the quantities of sets. So, while I love the extra features that Rebrickable has, I had to go with the lowest common denominator and use Brickset as my master set collection manager, and manually sync my collection back to Rebrickable as needed. I'll definitely take a look at these new features, and they might sway me to use Rebrickable as my master set collection manager again. Sounds like a bug to me. If you have a set in multiple lists it should add the quantities together and sync that number to Brickset. Did that not happen? Currently the code at Brickset treats each result separately and if there are multiple entries for the same set in the data then the quantity will be set to that specified by the last one. No arithmetic is performed at my end. It was about a month ago, and I spoke to Huw about it as it seemed more of a Brickset issue. As Huw mentioned, it would take the quantity of a particular set from one Set List, but if that same set was in another Set List it would reset the quantity rather than adding them together. It also had a number of other related issues on the Brickset side related to the Advanced Collection Manager (ACM). I know that both you and Huw are actively working on your code, so it may have already been addressed and fixed, and I will test more as time allows. I checked out the Drill Downs for sets, and it seems to be working great. Please raise it as a bug in the forum if you try it again and it doesn't work. for the theme ownership stat shouldn't there be a way to see if there isn't a set in that theme for the year I mean 0 of 0 is both 100% a no % right now it seem to be white. which make the graph less useful then it could have been. and the stat for the whole category as a % next t the category name would also be nice. Finally upgraded to a Pro account, love resources you continue to build for us.